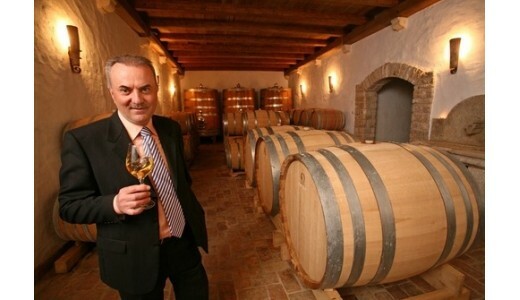 The story of winegrowing in the Markežić family dates back as far as 1891 when the first cornerstone was laid with the Momjan Muscat. Since then up to the present day hardworking and patient hands have been weaving this incredible wine story inspired by the desire to distinguish oneself by being genuine and unique. Today they managed to shape our own recognizable style through the brand KABOLA. Situated at the north-west of the Istrian penninsula, on 275 m above the sea level, with the view of the Alps and Dolomites on one side and the lush greenery of intact nature and a beautiful sea panorama on the other. The vineyards are located on a hill Stancija in the vicinity of the winery at Kanedolo near Momjan. The soil consists mainly of clay and is rich in marl, giving the wines their special characteristics. Kabola wines stand out from the crowd by their organic principles in wine production. After long maceration, the wine ages in oak barrels for 16-18 months. The wine has an intense ruby-r..
Istrian Malvasia has been grown in our region since the 13th century and the wine from these grapes ..
Our wine Malvazija Amfora represents the first attempt ever in our region to offer the lovers of spe..
Wine produced from the Istrian Malvasia which is grown in the interior of Istria on the soils rich i.. The wine produced from the grape variety Merlot is rich in alcoholic content and acids. After long m.. The Momjan Muscat is an indigenous grape variety of Momjan area. Thanks to its position and microcli..
Teran is an old indigenous Istrian grape variety with characteristic ruby-red colour. After long mac..